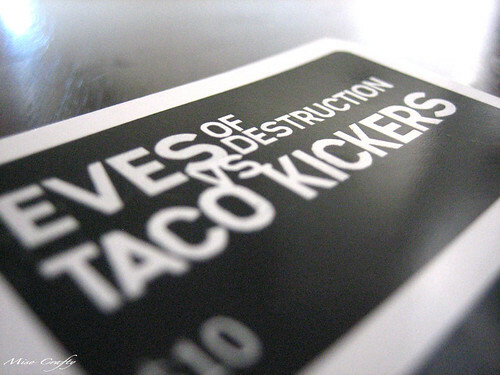 On Saturday night I finally went to an Eves of Destruction bout (they were up against Western Washington State's Taco Kickers. Brett loves that name!). I've been wanting to see the Eves in action ever since I moved to Victoria, but could never make it. Brett had planned a babysitter and bought us tickets, but unfortunately the Munchkin came down with quite the fever and massive rash from what we thought was a side effect of his 18 month immunization shots. Turns out, after Brett and Munchkin spent all yesterday morning waiting in the ER (Brett insisted I stay in bed and sleep as much as I could), that the wee one indeed has measles! The doctor thinks he must have contracted it a week or 2 before he got his measles vaccine, since the virus percolates in the body for at least a week before symptoms appear. My poor baby! But before we knew what was really up with the Munchkin Brett decided it would be a waste to not go to the bout and opted to stay home with the sick kidlet while I went forward with the original plan of seeing the Eves in action. Alone. I have a thing where I fear going to things and places where I don't know anyone by myself. Yet, I don't mind eating solo at a restaurant. Go figure. Anyways, so I went by myself and I had a blast! Luckily I brought a small knitting project along to keep me occupied while I waited in line to get in (which garnered a lot of weird looks). Although, I did make friends with a first-time derby watcher and a former score whore, who gave me the lowdown as to what happened to Victoria's second derby team (it folded due to lack of interest on the owner's part). And would you believe that I don't have a single article of clothing that is purple?? But that's ok, I'll have more time to get something for the next bout. If not, I did end up purchasing an Eves tee. 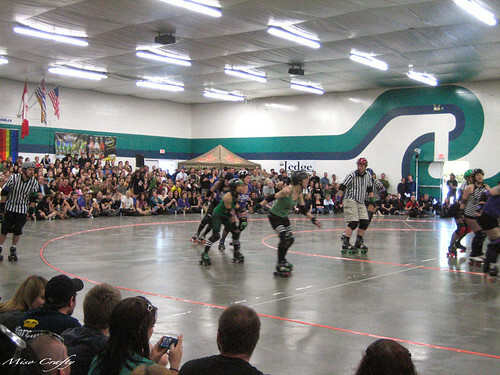 I kind of feel guilty for cheering on the Eves, since I was (am) a fan of Vancouver's Terminal City Rollergirls. Anyways, going to an Eves' bout was one of my 101 goals, one that I wasn't sure I'd be able to do (since there always seems to be a scheduling conflict and having the wee one around makes it hard to just pick up and go). I'm hoping to be able to make it to more bouts and who knows, maybe Brett will be able to go with me for at least one of them. In the meantime, I look forward to their July 3rd bout and wish I could be in Vancouver this Saturday when they take on The Bad Reputations.